Looking for cheap car hire at San Luis Obispo Airport, California? 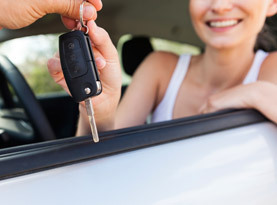 Compare quotes from a number of car rental companies with pickups at the airport. Once you have chosen the date and time for pick up at San Luis Obispo Airport, the drop-off destination and date, type of car needed and the age of the main driver, hit enter and compare prices from a range of available rental cars that can be booked online instantly. There are limited public transport options at San Luis Obispo Airport and within the surrounding area, which makes hiring a car and self-driving a good alternative. San Luis Obispo Airport is also known as McChesney Field and is situated just a short drive south of the city of San Luis Obispo in the California county of San Luis Obispo. The airport handles flights to other nearby cities including Los Angeles, Phoenix and San Francisco. San Luis Obispo Airport is a popular pick-up location for hire cars, with most major companies offering services at the airport. By booking your rental car online in advance you can be assured of the cheapest possible rates. After collecting your rental car at San Luis Obispo Airport the city of San Luis Obispo has much to offer with numerous cultural attractions, great restaurants and other entertainment options. The city is green with fantastic city parks perfect for enjoying the warm weather. With your hire car, you can explore the picturesque surrounds of the city and the thriving vineyards, which have daily tours and wine tastings. The surrounding area of San Luis Obispo Airport has mild weather year round with little rainfall, especially during the summer months from June through July. The winter at San Luis Obispo has lows of 3°C during the night and 17°C during the day.